This checker board can also use as chess board.They have same square, same color, same amount of squares and same flat. This giant board is made of high quality Teak wood, so it is very durable. You can put it at your garden or your yard for long time. You do not need to worry about the damage because we prepare the product for outdoors use. We choose the best quality Teak wood as main material, so that it will be safe for you to take it for outdoors use, such as parties, decoration, checker or chess games, photo section or another activity. Get excellent price from us as wooden board manufacturer. 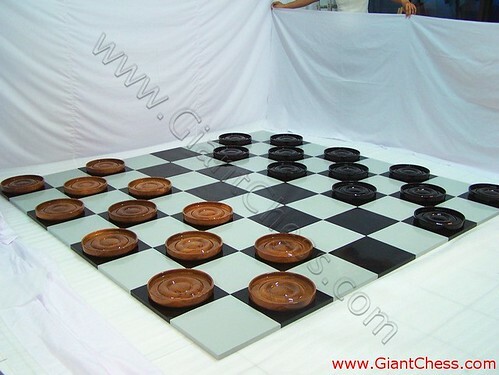 We serve also outdoors chess table, giant chess for garden, wooden chess pices, giant chess pieces, chess set with its board, checker pieces in various sizes, and many more wooden chess products. Our products are suitable for outdoor and indoors decoration. Just contact us and choose your favourite one!